The other contributions can be found here. I write purely from personal experience. As ever, any feedback / criticisms are welcome. This year our year elevens have been tested a lot. They’ve been tested more than anything I’d experienced in my first two years of teaching, and more than I’d have probably liked If asked in September. I can’t commend the students highly enough for their efforts and application during these tests. If results turn out well (fingers crossed) then I’m pretty sure their efforts during these tests will have been a significant contributing factor. One of the reasons the tests were so effective, I believe, was down to their authenticity. 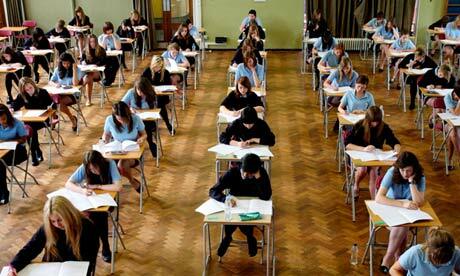 Each mock exam that our students sat was completed in complete silence, in the hall, for the full amount of time. There were no interruptions or pauses, and students hadn’t seen the papers before. Bags were in lockers, name labels were virtually always on the desks. Aside from the external marking, these mock exams / tests were the real deal. With authentic tests came authentic data. By having the time and space to complete the mock tests in the hall, we didn’t have to break past paper attempts in to smaller chunks. The authentic experience also led to increased effort. The atmosphere inside the exam halls were incredible, and we all marveled at how hard students would work if they felt that the situation they were in was leading to something important. Furthermore, by completing an entire paper and not individual questions in separate chunks, we were able to get a really clear indication of how students were performing in timed conditions across the whole paper. From a very early stage in the year, I knew which of my students struggled with timing, and which struggled with specific questions. And, as we repeated the testing process, I could easily track who was improving and who wasn’t, planning my responses carefully. Because the papers were completed in an authentic environment, and represented the students best efforts, I always felt that my feedback was important. As a department, we were quickly able to spot trends and common errors across the different questions. This helped use give students question specific feedback quickly and easily, as we soon developed a set of codes for the common errors we identified. With this information, we were not only able to track student’s overall performance, but we could track student’s feedback very easily. From test to test, students could see which questions they were achieving well in and what feedback they were getting to improve. Again, it became very clear who was really engaging with their feedback and who was struggling to do so. The question specific feedback also helped us plan lessons and some after-school revision sessions more efficiently, addressing the weaknesses the tests had identified. One of the most common complaints about the exam system is the effect that they can have on a student’s emotional health. Obviously, for many students exams can be extremely stressful and as a teacher there can be few experiences more heart wrenching then watching students crack under this pressure and perform below their best. This happened to a few of my students, but it happened in November, not June. For almost the whole year, I knew which of my students struggled with exam situations and the feelings of pressure. For the rest of the year, I was able to give them a little extra reassurance, extra smiles and extra praise for any small improvements. If the student’s testimonies are anything to go by, then there were no such breakdowns during the real thing. Another complaint often made against tests is that they don’t really teach kids anything, they just measure ‘how good they are at exams’. One way to combat this is through walking-talking mocks. Essentially, these involve a subject expert talking through the steps needed during the exam process. For instance, the expert could direct the room full of silent students towards how to plan an answer, how to prepare and approach different questions, or how to actively read exam questions and passages. Here, the teacher models the approach to the exam, helping students gain confidence with their exam technique. Clearly, this style of mock does not provide quite the same authenticity when it comes to results, but they help model essential exam technique and give students a great confidence boost. I also feel that the tests themselves actually did help our students learn. We were really worried when one of the language mock papers occurred when we were heavily immersed in studying literature. We presumed that results would dip massively because we weren’t studying the content of the mock in normal lessons. But, results stayed constant, and many students improved. Perhaps this is because the tests help students recall the exam strategies and subject knowledge they’d been practising previously. Joe Kirby’s blog on curriculum design is excellent on explaining possible reasons for this. Aren’t you worried they’ll hate the subject? I think this is another common criticism against mock tests. I was certainly worried that doing so many language mocks would stifle their love of literature and lead to a poor numbers opting to do A level English Literature. All signs suggest that my worries were unfounded. Not only did repeating the mock exams make taking exams seem part of a wider routine, they also gave students an opportunity to improve. Many of them relished this opportunity, desperate to improve their result and achieve that allusive C, B, or A*. There’s also nothing like the taste of success to help students feel positive about the subject. Improvement in authentic mocks provided this taste of success to many, and gave many students a more positive perception of their own ability in English. Numbers for next year’s Literature course look promising. Aren’t we turning them into exam factories? Of course, I want my students to love English. I want them be readers for the rest of their lives. I don’t want them to stop exploring language when they leave school and I’d love for some of them to carry on writing for pleasure. But I also want them to succeed. The school I work at does not have a long history of outstanding GCSE results or sending children to top Universities, but that needn’t be the case for the years to come. Exam success is a gateway further study. So long as my students are assessed by an external examination, I’ll do my best to prepare them for this situation. Are ‘outstanding’ lessons what’s best for my students?